I would like to acknowledge that this project takes place on the very beautiful traditional and unceded lands of the Wolastoqiyik and Mi’kmaq, of the Wabanaki Confederacy. I acknowledge that my family are immigrants to this place, that I am a first generation New Brunswicker and a seventh generation Canadian, and that my lineage ties me to the industries of our settler culture (pulp and paper, commercial agriculture, fine arts, science). Our people and our way of life have divided and itemized a wholeness into finite parcels of property. We have transformed the animate landscape and more-than-human communities into a collection of objects. I acknowledge that the steps I take here won’t remove me from this earth or undo what has been done, so I walk here to discover in my body the relationship between my colonial heritage and the possibility of decolonization. I dance to imagine these apparently political notions as states of being, as ways of moving through the world. I recognize imperial patterns written into my very gestures, and imagine how decolonization might dance. Lucy’s project Esemplastic Landing borrows the poet Coleridge’s word, meaning “molding into one.” As the flow of a river is inseparable from its banks, Lucy’s movements are both shaped by and carved into the Wolastoq (Saint John) River, the Petitcodiac watershed, the ubiquitous forest, intermittent outcrops of asphalt and marshland, and the Bay of Fundy. 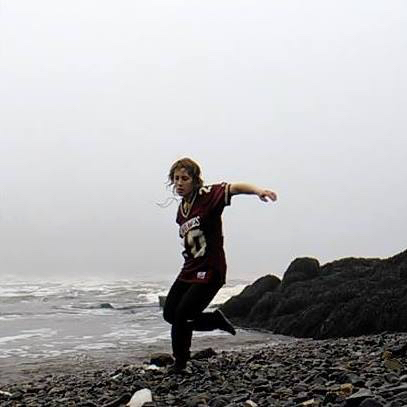 In 2016-2017, after seven years of performing around the world, contemporary dancer Lucy M. May returns to her Maritime homeland as an Artist-in-Residence. In and between New Brunswick’s southern towns and cities, Lucy will move through grass, mud, water, and wind for three months, across asphalt and train tracks. Her research will lead to a dance practice contiguous with the land, and shared with the community. Inspired by David Abram’s book The Spell of the Sensuous, Lucy will practice techniques for heightening her senses and steadying her attention. Abram’s views on language, sentience, and magic consolidated her vision of dance as an oral tradition, and the dancer as a conduit. She takes further cues from writer Lewis Hyde (The Gift), biomechanist Katy Bowman (Move Your DNA), filmmaker Werner Hertzog (Of Walking in Ice), as well as choreographers and performers such as Eiko Otake and Simone Forti (Handbook in Motion). Esemplastic Landing proposes an extreme shift in scenery and a radical reduction of technical and choreographic structures for Lucy—a simplicity that allows her to question how a danced language (like an alphabetic one) encodes or decodes a culture—how gestural conventions draw near or distance a person from their environment. She self-documents the work in drawings, a kind of ongoing notation of her improvisations, in voice recordings and conversations, avoiding written note-taking as much as possible. Seeking to strengthen her ties to New Brunswick and its communities, Lucy will walk with others through local landscapes. She will make “kinetic field recordings” of the stories surfacing in bones, muscles, and organs, while traversing short and long distances together. Other kinds of showings and interactions will be developed as the residency evolves, giving Lucy space and time to experiment sensing, showing, and being seen. All open-air performances will be gifted to the community, free of charge. Visit Facebook for more information. Please contact Lucy below or on Facebook to participate in walks or other activities. Alternatively, connect with Atlantic Ballet Theatre of Canada, The St. John River Society, and Professor Thaddeus Holownia at the Fine Arts Department at Mount Allison University, who are helping Lucy share Esemplastic Landing with New Brunswick communities. Lucy is grateful for the support and collaboration of these partners, as well as for the generosity of Theatre New Brunswick. Lucy M. May thanks the Conseil des arts et des lettres du Québec for its financial support.